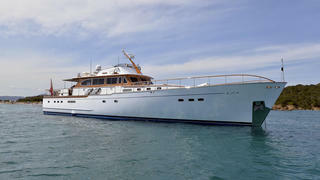 The 29 metre motor yacht Ardis II has been sold with Francesco Vitale at Nauta Yachts acting for the buyer and seller. Built in cold-moulded mahogany by Italian yard De Cesari, she took 19,000 painstaking hours to construct by the yard’s craftsmen and was delivered in 2006 with a refit in 2009. An interior in mahogany faced with teak veneers accommodates eight guests in four cabins consisting of two VIP suites and two twin cabins, all with entertainment centres and en-suite bathroom facilities. In addition, four crew are accommodated in two cabins. The saloon has large windows allowing the light to flood in and is fitted with built-in off white settees to form two conversation areas: one around a large teak coffee table and another in the dining area along with an office desk. Forward is the helm station with a single seat, while there is also a full entertainment centre including a large television and a stereo surround sound system. The aft cockpit serves well for al fresco entertaining and dining, with a table and chairs and a large Bimini top providing shelter from the sun. The small sun deck is given over entirely to a super king sized double lounger sheltered from the wind by mahogany screens forward and to port and starboard. Twin 1,500hp MTU engines give her a cruising speed of 23 knots and she is fitted with zero speed stabilisers. Lying in Italy, Ardis II was asking €3,200,000.